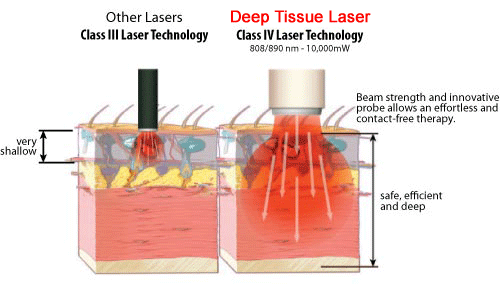 We are pleased to offer Deep Tissue Laser Therapy by Litecure. The LightForce Ex from LiteCure is the most powerful Class IV Laser-Massage® System currently available to medical professionals to provide laser therapy to their patients. The LightForce Ex can deliver up to 15 Watts of deep, penetrating laser therapy through an innovative, optically correct quartz ball, which provides massage benefits in addition to the increasingly proven therapeutic results of the Class IV laser. By mechanically manipulating soft tissue as laser light is delivered, deeper structures are exposed to photonic energy, resulting in more rapid healing and improved pain relief through photobiostimulation. The LightForce Ex is a new, drug-free therapeutic option based on science. Tissue that is damaged and poorly oxygenated as a result of swelling, trauma, or inflammation has been shown to respond significantly to laser therapy irradiation. At the cellular level, deep penetrating photons activate a biochemical cascade of events leading to increased DNA/RNA, protein and collagen synthesis, increased cAMP levels, and cellular proliferation. The result of these reactions Is rapid cellular regeneration, normalization, and healing. Laser light energy is highly absorbed by skin and subcutaneous tissue; therefore, penetration is key to making the therapy work. Longer wavelengths and higher power outputs result in deeper penetration of and higher dosage to the tissue. Larger laser therapeutic dosage levels produce improved clinical outcomes. Class IV lasers have been shown to provide both the wavelengths and output power levels necessary to trigger therapeutic, cellular metabolic changes. When applied using scientific treatment protocols, the Class IV LightForce Ex deep tissue laser therapy system provides demonstrated clinical therapeutic benefits to patients in a clinical setting for a wide range of both acute and chronic diseases, regardless of age or gender. Litecure Class IV Deep Tissue Laser Therapy is a safe, effective, non surgical, drug free approach to treating pain, inflammation, and limited mobility. Check out these Scientifically documented healing effects. Accelerated Tissue Repair and Cell Growth- Photons of light from the laser penetrate deep into tissues and accelerate cellular growth and reproduction. The Litecure Laser light frequencies increase the ATP energy available for nutrient uptake and waste removal. Cells in tendons, ligaments, cartilage, and muscle heal and repair faster. Faster Wound Healing- The two wavelenths used by Litecure EX stimulate fibroblast development in damage tissue. Fibroblasts build collagen for wound healing. Collagen is the repair tissue made for healing a cuts, wounds, and torn/injured tissue. Thus Litecure Laser therapy can be used on open wounds, burns, rashes, and to reduce post surgical scars far more quickly and efficiently. Improved Vascular Flow- Litecure Laser Therapy significantly increased the formation of new capillaries within damaged tisuue. This speeds up healing, by increasing blood flow into the damaged tissue and can also help close wounds more quickly and reduce scar tissue formation. Increased Metabolic Activity- The specific wavelengths used in the Litecure Laser Therapy increase production of specific enzymes, oxygen and nutrient supplies for blood cells to carry. More healing can be completed in less time. Analgesic/Anti-Pain Effect- The litecure laser has a highly beneficial effect on the nerve cells within the injured area by blocking pain signals transmitted by these nerve cells to the brain. This decreases nerve ending sensitivity hence less pain. By reducing inflammation and edema as well pain is also further decreased. Reduced Fibrous (scar) Tissue Formation- Treatment of acute or chronic injury by Litecure Laser Therapy will reduce scar tissue formation and build up which is the result of inflammatory processes. Scar tissue is less elastic, has poor circulation, is more pain sensitive, weaker, and much more prone to re-injury and frequent injury exacerbations. Helping your body to eliminate and break down scar tissue thus increases flexibility, circulation, strength, and reduces pain, re-injury and chronic problems. Anti-Inflammatory Effect- Litecure Laser photon emission causes vasodilation (expanding of blood vessels) and activation of lymphatic drainage systems. This is how the inflammation and edema (swelling) are reduced which reduces pain (the Analgesic Effect) as well. Improved Nerve Function- Slow recovery of optimal nerve function in the damaged tissue can result in numbness and impair limb function. Litecure’s Deep Tissue Laser light speeds up the process of nerve cell reconnection and increases the amplitude of nerve cell action potentials that maximize healthy muscle contractions. Stimulates Trigger Points and Meridian (Acupunture) points- The Litecure laser light relaxes focal muscle spasms called trigger points which helps to restore healthy normal muscle tone. The light also stimulates or activates meridian acupuncture points having similar effects on them as a standard acupuncture treatment without the insertion of needles.